I arrived at Paddington Station and made my way hurriedly toward the underground. Suddenly, I found my feet sliding, no control, left knee smacks into the hard tile floor, right leg twists awkwardly, the right ankle is in some pain. A helpful gentlemen helps me up. I recover and get that the floor has become an ice rink in some places (food for a future post). I walk slowly, in pain, towards the underground…. I hurt myself. Why? Because, the ‘vehicle’ for enabling-facilitating walking at Paddington Station was not fit for purpose. What do I mean by that? That one of the primary functions of a floor is to make it easy for folks to move around, at normal walking speeds, safely. Before, I get further into this, I want you to get that Paddington Station is one of the main railway stations coming into and out of London. There are always plenty of people standing around and walking about. It is especially heavily trafficked at peak time (early mornings, after work). And there are all kinds of people using this station: older couples, middle aged folks, youth, male, female, business folks, leisure travellers etc. Customer Experience: What Is The Default Setting? Why is that the floor at Paddington Station did not facilitate one of its primary roles: enable passengers (customers) to walk about easily, freely, quickly (if need be) around the railway station? Because it was raining. Some of the rain ended up on the smooth, good looking, tiled floor. The rain on the smooth floor, reduced the already reduced friction/traction – to the point where it is really easy to be walking one second, sliding the next, and then finding oneself in pain, hurt, on the floor, dazed, wondering what happened. Let’s stop. I invite you to ask yourself, how is it that intelligent business folks did not put the various elements together to foresee (smooth floor, rain, floor as ice rink) and thus prevent the annoyance and/or harm to the passengers? My hypothesis, is that insufficient attention-consideration was given to the customer. Did anyone even put the ease/safety of walking as a key decision criteria when the floor was being selected? It is easy to be smart with the benefit of hindsight. So let’s accept that with the best of intentions we are fallible creatures and make mistakes. Before we move ahead, I do wish to make one general point: the default is that of poor customer experience and this is so because the world has been setup without adequate consideration of experience based customer needs. In my view, this is particularly so in nations-cultures with a strong Protestant-Calvinist influence. Incidentally, the lack of consideration of the end users experience based needs is the reason that most CRM systems fail to be adequately adopted and thus fail to generate the promised benefits. Desired outcome: make it easy and safe for all the usual customers to walk around the station, given many obstacles (usually fellow travellers), in all the usual weather conditions – rain is usual in the UK. Imagine that you are the person responsible for Paddington Railway station. You are the person confronted with coming up a course of action to deal with what is so and bring about the desired outcome. What is the course of action that you’d take? What would the end solution look like? Would you fix the roof so that no rain got through to the floor? Would you fix the floor to ensure that the floor is rougher thus providing more traction? Would you put some kind of drainage solution to drain water from the floor? What would you do if you were truly customer-centric and committed to putting the right customer experience (of walking) in place? Let’s stop and consider this. Has the challenge been addressed? Has management got rid of the potential hazard to customer safety? Has management improved the customer experience? No! What has management done? 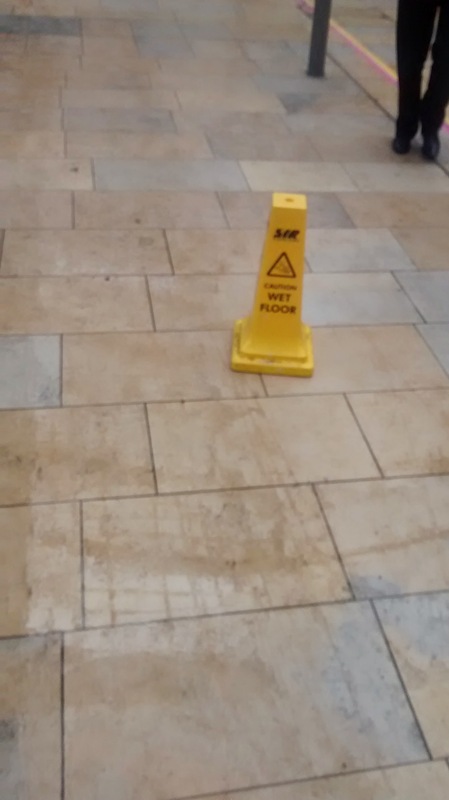 Management have provided some useful information to the customer: “caution wet floor”. What else has management done? They have placed the burden of responsibility on to the customer – now if the customer slips and hurts himself he can blame himself for being careless. And management has mitigated its liability under the health and safety legislation. Why have I shared this with you? Because it occurs to me that this concrete example illustrates the course of action that many have taken regarding Customer Experience challenges-opportunities. There are only a handful of organisations that compete on the basis of the Customer Experience and excel at it. These organisations continue to do well. For the folks in these organisations Customer Experience is a way of life – like speaking English is a way of life for me. The vast majority of Tops and Middles toying with Customer Experience lack the courage to take bold action. In the absence of courage, a ‘burning platform’ is necessary to trigger bold action. For most organisations and management teams such a burning platform is not present. Look beyond the fear mongering and ask yourself how many organisations are in the shape IBM was when Lou Gerstner took over and kind of totally reshaped IBM? Where work has been done on Customer Experience, Tops and Middles have taken the easy way out, tinkering on the edges. The stuff that really matters has been kept intact. The business model remains intact. Management practices including those that yield ‘bad profits’ – profits made at the expense of the customers – remain intact. Many claim to be Customer Experience experts and/or gurus, almost none of them are. Before you accept this claim I ask you to consider how you would determine if a carpenter is a great carpenter. Would you do so by listening to him speaking? Would you do so by reading his book where he share his tales and tales of others – stories which make you feel good? Or would you go and see for yourself that which the carpenter has created with his own hands? This has to follow logically and necessarily from point 1 above – there is only a handful of organisations that compete on the basis of the Customer Experience and excel at it. One reason that so many can get away with claiming to be Customer Experience experts and/or gurus is that the term Customer Experience has been turned into an empty and usually misleading idea. For example Customer Experience is became another fashionable, higher status, label for Customer Service; many folks of significance in Customer Services (including call-centres) have customer experience in their titles. On the other hand some marketing folks – especially digital marketing folks – are using and abusing this fashionable label. Then there are folks who oversee the execution and compilation of customer surveys – they have also chosen to sit under and claim the Customer Experience label. Maz, I guess it is simply a question of priorities. Is the priority the customer experience or minimising cost by buying cheap tiles and not fixing the hole in the roof? Next Next post: Customer / Leadership: What Is The Access To Cultivating Greatness?